Corporate Magician Birmingham Owen Strickland. December was a great month for me with a number of Christmas Bookings and Corporare Events. 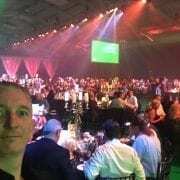 The largest was a huge event at The ICC for JDB Events who book me every year for the same event. 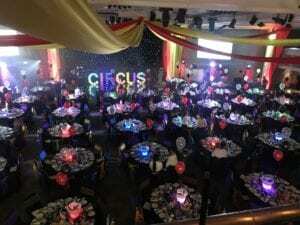 This year was a circus theme and saw some amazing aerial acts. Also singing waiters starred in this amazing event. Other notable venues were The Four Pillars Hotel in Oxford, which hosted the Trip Advisor Xmas Party. 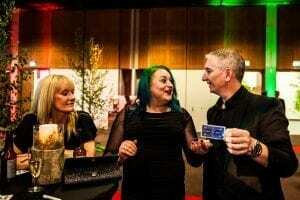 I was privileged to work with another great magician Paul Preagle, who was amazing. Staff Christmas Parties were also popular, notably at the Birmingham Botanical Gardens and at jewellers In The Jewellery Quarter. 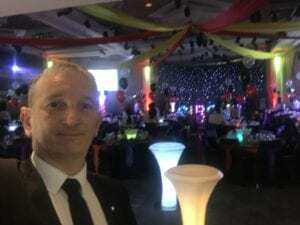 There was also a huge event at the Belfry for a local family. Finally my usual New Year Eve booking at The Woodside Hotel in Kenilworth finished a great December for me. Midlands Corporate Magician Owen Strickland Telford International Centre. A Huge event for Blakemores Cash and Carry based in Walsall. I used to shop there all the time when I used to run a pub in Walsall. 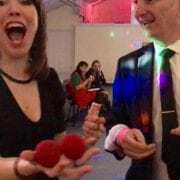 Firstly it was mix and mingle magic in the pre drinks room, which was itself huge. In addition to me were walking trees, vape machines and sweet stands. Following this guests went on to have dinner in a room with 8o tables!! Now wedding season is closing it will be Corporate events for the next few months and the run up to Christmas. Birmingham Corporate Magician at Calderfields-a very local venue. I am booked for a number of Weddings at Calderfields this year. 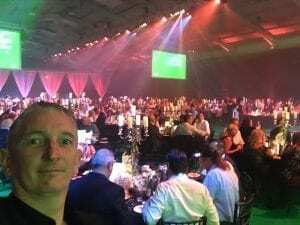 However tonight was a corporate event for a change. Filon Products had their anniversary dinner here. The owner Steve saw me at a wedding a few weeks ago and booked me to attend. Calderfields team did their usual amazing job,led by Alesha. She even managed to give me a lovely Chicken dinner as well! 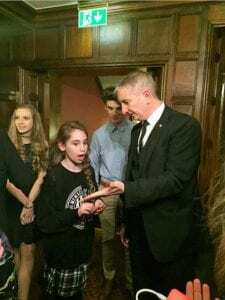 Birmingham Magician Owen Strickland-New Hall Hotel for a family private dining party. Tonight I was privileged to perform at a small private dining party. This was at the fabulous New Hall Hotel In Sutton Coldfield. Truly one of the most exclusive venues in the Midlands, the Wardle Family had booked me for this special Family occasion. 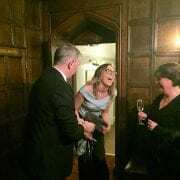 I met the family as a surprise as they entered the drinks reception. 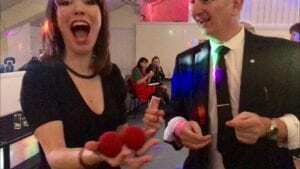 First I performed some mix and mingle magic, which was when the photos were taken. I then went onto the meal and performed table magic between courses for the whole table. There was much laughter and surprise as I performed. The family were a delight to perform for and I very much enjoyed it. Birmingham Magician Owen Strickland is the perfect accompaniment to an event such as this. Magic calms the nerves of the guests who sometimes have not seen each other for some time. It gives a talking point when there are those awards silences. Magic also means guests are guaranteed to have fond memories of the evening. 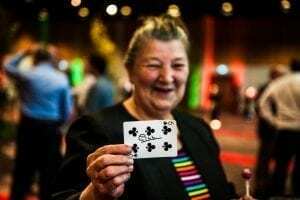 As the photographs show, it also captures some amazing action shots for the family to treasure.Magic is also suitable for all ages. This party had a real mix of ages across the spectrum. A good magician, such as Birmingham Magician Owen Strickland, can adapt his style and presentation to include all spectators. This was the first booking of the year at New Hall. I will be back later in the year for a number of Weddings. 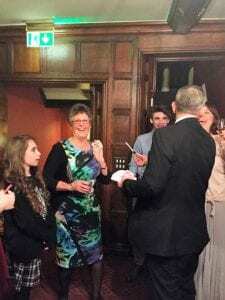 Birmingham Magician Owen Strickland at Woodside, Kenilworth On New Years Eve.I was very honoured to be booked for the second year running for this event. Woodside were thrilled by the positive Trip Advisor comments guests left after last years NYE booking. They booked me for this year back in January. The even better news is they have now also booked for NYE 2017! Guests will have an amazing meal of around 7 courses and great entertainment, with live music, DJ, Casino and me! Walsall Magician Owen Strickland had a rare treat tonight. I was booked to perform at Prego in Aldridge, which is my local where socialise on nights off!! By chance the company that booked me had booked their Christmas Party there!! 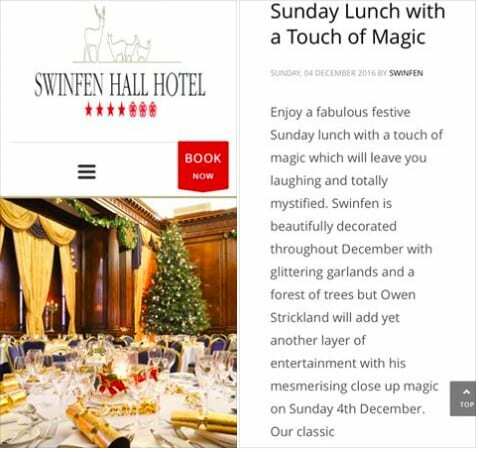 Swinfen Hall Magician Owen Strickland Christmas Lunch.This Sunday I will be performing at Swinfen Hall where I am the recommended magician. I will be visiting each table and performing close up magic for guests as they wait for their food. 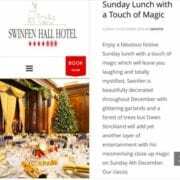 Why not pop along and have an amazing Christmas lunch and a little bit of magic thrown in too! 12.30-1500 I will be there.